Provide comfort for the family of Olga Przybilla with a meaningful gesture of sympathy. Age 89 of Minneapolis. Preceded in death by husband, Bernard & brother, Myron Bachynski. Survived by daughters, Kimberly (Terrance) Noble & Kristina Przybilla; granddaughter, Keyanna; siblings, Donald (Mary) & Alexander Bachynski, Nettie Konopliv; aunt, Pauline; nieces, nephews & other relatives. Visitation at KOZLAK-RADULOVICH CHAPEL (1918 University Ave. NE) Thursday from 5-8 PM with Vigil Prayers (Panachyda) at 7 PM. Funeral service at ST. MICHAEL'S & ST. GEORGE'S UKRAINIAN ORTHODOX CHURCH (505 - 4th St. NE) Friday at 10 AM. Interment Sunset Cemetery. Memorials preferred to Catholic Eldercare or Our Lady of Peace. We encourage you to share your most beloved memories of Olga Przybilla here, so that the family and other loved ones can always see it. You can upload cherished photographs, or share your favorite stories, and can even comment on those shared by others. Uncle Don, Aunt Mary, and cousins sent flowers to the family of Olga Przybilla. Our deepest sympathies, you are in our thoughts and prayers. 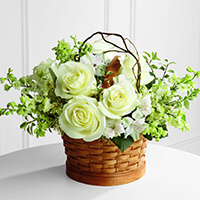 Uncle Don, Aunt Mary, and cousins purchased the The FTD Peaceful Garden Basket for the family of Olga Przybilla. Sorry to hear about your Mom's passing. May she rest in peace.